How did you become the first Wikipedian in Residence for ECPMF at the Osservatorio Balcani e Caucaso? I started ten years ago to submit articles to Wikipedia. So when Wikimedia Italia and OBC issued an open competition for this position, I thought that I could unite many of my skills and interests: first, being an active Wikipedia contributor, second being particularly interested in the Balkans – just now I am doing my PhD on the European integration of the Western Balkans – and third journalism – I am the deputy editor of the Italian-language online newspaper EastJournal.net which deals with Central and Eastern European affairs. Could you elaborate on the structure and benefits of the residence project? Why do organisations cooperate with Wikipedia? The Wikipedian in Residence is a collaboration within the ECPMF between OBC and Wikimedia Italia. This is happening within Wikipedia's GLAM-Project (Galleries, Libraries, Archives and Museums), where all kinds of cultural institutions start a collaboration with Wikipedia for common benefit: Wikipedia gets direct access to the cultural institutions as sources of knowledge, and the institutions get access to the encyclopaedia as a means of dissemination of their work. So I started working at OBC in the beginning of October and will stay for half a year. Which projects did you realise so far, having been at the OBC for one month now? I started mapping where the information catalogued in the ECPMF Resource Centre could be added to Wikipedia, and decided to develop a series of articles on the media system in each country of East and South-East Europe (e.g. Media of Serbia ), as well as – subsequently – a series of more specific articles on the state of media freedom and censorship in each of them, too (e.g. Censorship in Serbia ), based on the reports of different independent organisations as open-access and reliable sources for them. Moreover, we launched a specific action for the 2nd of November, which is the “International Day to End Impunity for Crimes against Journalists”. We translated into Italian the Wikipedia articles about five journalists who had given their lives. Those were Ivo Pukanić , Slavko Ćuruvija , Natalya Estemirova , Georgiy Gongadze and Ihor Kostenko , who deserve to be known and remembered as much as Hrant Dink or Anna Politkovskaya, who also lost their life due to their profession. This is a great example of how to support press freedom in general with the use of Wikipedia. Can you also give me an example of the advantage of the encyclopaedia for the single institutions collaborating? Wikipedia may work as a tool of dissemination for their content. Last month there was a report of Bianet (an independent Turkish press agency) on the state of media freedom in Turkey which I used as source to revise the article about Censorship in Turkey . Then last week, with the elections and the intrusion of police men into several media outlets in Turkey, this article had a spike in visits, it was seen by over 2,000 persons in not even two weeks. So I could spread the content of Bianet to a wider audience while using it as source for a Wikipedia article. Do you feel that in your positions as Wikipedian in Residence, you are having an impact? I personally contribute to Wikipedia because I think it does have an impact on the way people get informed. Wikipedia is the tool where information is only at one click distance and it is often used as first point of reference. I like to contribute to that and improve it. The important point is that one has to learn how to use Wikipedia critically as much as one should look critically at every information disseminated by the media. By using Wikipedia, readers get accustomed to the idea of critically examining what they read, to check if a certain statement has a source and if it is trustable – this is a good way of educating people to approach media in general with a critical attitude. In addition to that it is right that Wikipedia should not be used as a source – because it is an encyclopaedia and not a primary source. Everything written there needs to have a source itself. So in a way it is also a matter of understanding the place of Wikipedia within the broader media panorama. You are not the first Wikipedian in Residence – there exists a long lists of collaborations between Wikipedia and cultural institutions all over the world. Often they try to integrate the Wikipedia community into this programme. Do you plan events to make Wikipedians more aware of media freedom? Nothing is fixed yet, but there will be some events. I already have some ideas, for example to organise an Edit-a-thon - an event where the Wikipedia community from different language versions works together on a specific topic to improve the encyclopaedia. So far, I shared my work with the WikiProject on Freedom of Speech, where Wikipedians interested in that topic can share their ideas and help each other. I want to connect with Wikipedians from many language versions. What I am putting now online in English can be spread to other versions and – most importantly – what is available in local languages could be translated to more widely used languages to have a bigger benefit of this knowledge. It is common practice to have a social media expert who is only taking care of Facebook and Twitter. Do you think that the use of Wikipedia is underestimated by cultural actors? Should they start focussing on Wikipedia as dissemination tool, take care of their pages and see if they can spread their content there? No, Wikipedia should not be used in that sense. This could even be dangerous as it could lead to self-promotion. Wikipedia should stay free, collaborative and neutral Authors should not be paid to push the content of some specific actor. The distance between the holder of interest and the contributor is important. When someone is contributing as part of the GLAM-Project or as Wikipedian in Residence, like I do, they do this under a specific username including the name of the institution. If anything seems to be self-promotional, people can identify me and the organisation and I can be notified about it. So yes, Wikipedia is important as a means of dissemination and it should be better known how it can be used for the best – but it should not be used as tool of self-promotion. And how can people learn how this can be done? It is not only my task to disseminate the reports of the Resource Centre, but I am also providing a Wikipedia-training to the team of OBC, so that the staff here can understand how the encyclopaedia works and how they can better contribute to it. 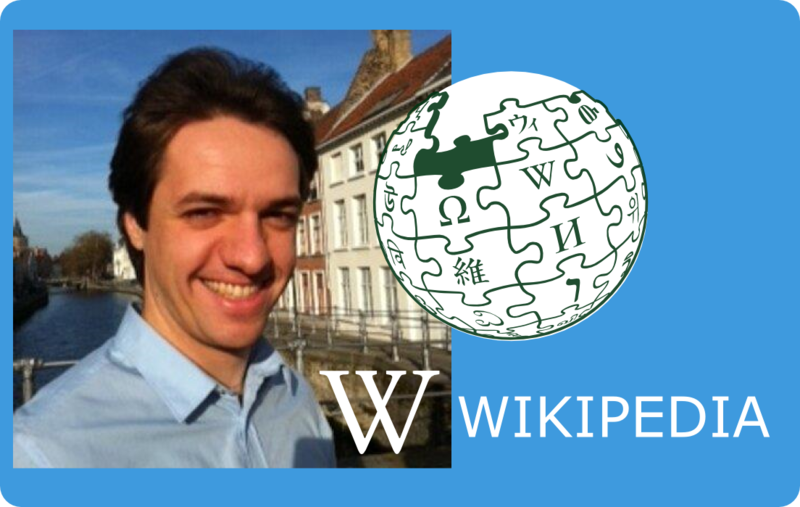 The Wikipedian in Residence project always focusses on sustainability: The institution learns how to make use of the encyclopaedia with awareness and at the same time the global project wins some well-informed contributors. It is not given that I manage to do all this in the short period of six months, but I clearly work with a perspective on the future use of my stay for OBC, the ECPMF and press freedom in general.